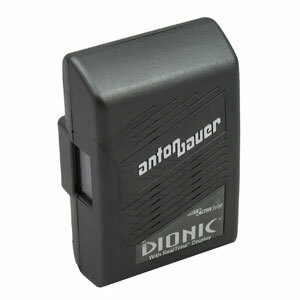 Dionic batteries are the perfect selection for the videographer with weight as the highest priority in selecting a battery. Dionic offers complete compatibility with PowerChargers already in the field (may require software chip update) and the Tandem series. Multiple electronic safety circuits, including the field proven reliability of the Digital Battery, and the mechanical integrity of IMPAC case construction have allowed Anton Bauer to design an all new battery which safely employs lightweight cell chemistry for the rigors of Eng use. Dionic 90 weighs only 1.7 lbs (770 grams) and is the highest capacity lithium ion battery which can be legally transported without restriction under the IATA and DOT safety regulations. Dimensions: 5-1/4" X 3-1/2" X 2-1/8", 1.7 lbs.